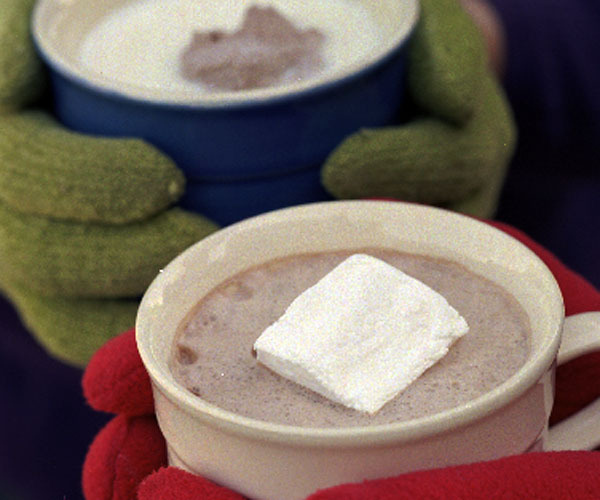 When most people make hot chocolate, they reach for the cocoa powder and sugar. Not me. I’ve nothing against plain cocoa; in fact, I use it to make an incredible Chocolate whipped cream. But when the yen for hot chocolate strikes, as it often does this time of year, I’m looking for a deep and intense chocolate flavor, as well as a rich and satisfying texture. The trick is to use good chocolate instead of cocoa powder. Cocoa powder is made by extracting most of the cocoa butter from chocolate liquor (ground roasted cocoa beans) and pulverizing what remains. Chocolate, on the other hand, is chocolate liquor that’s blended with cocoa butter, vanilla, and sugar. The added ingredients, combined with the extra processing that chocolate undergoes (such as conching, which makes it smooth), make all the difference. For Hot chocolate, I like the flavor of bittersweet chocolate. If you crave a touch more sweetness, you might instead want to try semisweet, which usually contains more sugar and less chocolate liquor than bittersweet. Whichever type you choose, make sure it’s the best quality you can find. Some folks judge chocolate by its combined percentage of chocolate liquor and cocoa butter (the more, the better), but I find that more doesn’t necessarily mean superior chocolate. The quality is just as important as the percentage. For me, tasting tells all. I note the chocolate’s mouth feel as well as its taste and aroma. Does it melt in my mouth? Does it leave an unpleasant aftertaste? A lot of chocolates do. Trust your own taste. I generally prefer European chocolates because they tend to be made from better-tasting cocoa beans, which are roasted at lower temperatures for a longer time, developing deeper flavor. I like Valrhona Guanaja, a bittersweet chocolate made in France (you can order it from Chocosphere.com). I think it’s the best chocolate available, with a clean flavor and no lingering aftertaste. To chop up the chocolate, either shave the block on a grater or break it into small chunks with a knife. I use a hammer to break up big chunks of chocolate (you can too, if you use the hammer just for chocolate: don’t go grab one from the toolbox). If you’re using a chef’s knife, use the heel, not the tip. You can even use a blender or food processor to chop a small amount of chocolate, though that’s not my usual method. The pieces should be fairly small (about 1/4 inch) so they’ll melt quickly in the milk. Chocolate pairs well with a startling variety of flavors, something I’ve discovered through years of making chocolates, candies, and truffles. Who would have thought that cardamom and chocolate go together, or that ginger and chocolate would be such pleasing partners? So even though I’m sure you’d be perfectly content to stick with my basic hot chocolate recipe forevermore, I’m suggesting a few Hot chocolate variations. You’ll see some unusual combinations, along with some matches that you’ve probably already thought of, like mint hot chocolate. The final technique I use to transform my hot chocolate into something really soothing is to froth the milk. If you’re a cappuccino or latté drinker, you probably like your milk really frothy, as I do. There are a couple of ways to achieve this effect. You can use a milk steamer to froth the milk and then stir in the chocolate pieces until melted. A blender also works. Just be sure to secure the lid and hold it down firmly as you blend. It’s also a good idea to place a folded towel on the blender lid in case any hot milk leaks out. 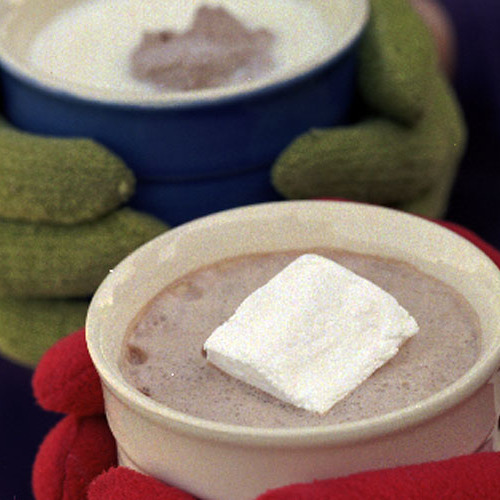 If frothy hot chocolate isn’t for you, mix the chocolate and any other flavorings into milk that has been brought just to a boil in a saucepan. Or use a microwave to heat the milk and chocolate together. Heat at medium-high power for three to four minutes, removing and stirring halfway through. 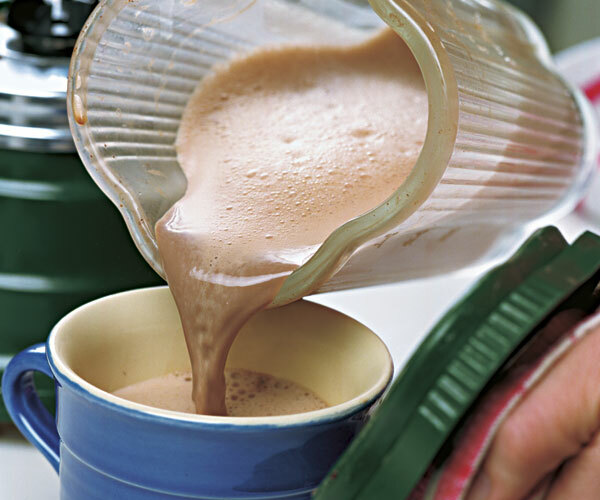 Thirty seconds in the blender is all it takes to foam hot milk. To avoid hot splashes, cover the top securely with a towel and start on low. As long as you’re making the effort to make extra-good hot chocolate, you might as well go for an extra-good homemade topping. 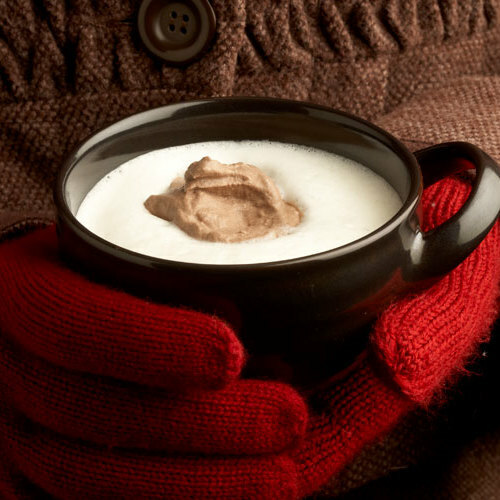 A large dollop of freshly whipped cream is never out of place on hot chocolate, of course. But Chocolate whipped cream is even better. 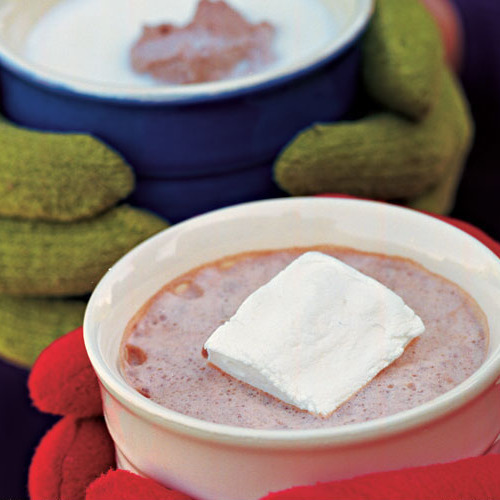 If you really want to wow yourself and your guests, try making your own Marshmallows. They’re not difficult, and they are truly fantastic, but start a day ahead.